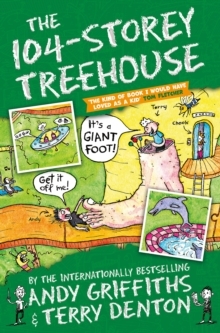 The 104-Storey Treehouse is the eighth book of Andy Griffiths and Terry Denton's wacky treehouse adventures, where the laugh-out-loud story is told through a combination of text and fantastic cartoon-style illustrations. Join Andy and Terry in their now 104-storey spectacular treehouse. They've added thirteen new levels, including a never-ending staircase, a burp bank, and even a mighty fortress. But Andy and Terry are in a race against time to find a funny story for their next book - will the tooth fairy, the two-million-dollar shop or even the riddles of the deep-thoughts thinking room be able to help?Well, what are you waiting for?